Found a centre at GQRP rally last w/e, go to http://www.amtoolsuk.com/ANTENNAPLATECP1PAGE.html for the details and read the drilling instructions. The centre unit is designed for 20mm conduit so for the cobweb 10m-20m you need poles 6' 6" long the poles I have are 4m poles from sky blue. The centre 2 sections are exactly 20mm at the base so I will use the centre two sections only. So will 'store the base and whip sections for something else. You could use thick walled 20mm conduit tubing, with some 'sag'. The great thing about the centre plate is the option of use of the 4 pole 90 degree options for all sorts of antennas. Not just a cobweb, I can see a wire beam as per spider beam should be possible as well. A tree at bottom of garden about 6 weeks or so ago a branch came down and took out my vertical. I obtained a new Ali pole and put it in place so the Hustler 6BTV vertical is back up and running again (managed a QRPp 80m qso with G3XBM with it yesterday). Anyway thinking time I need to add WARC bands 17m and 12m to it. Clive (M5CHH) had given me a small piece of plexiglass a while back. You need a piece 14 inch x 8 inch and about 1/4 inch thick. The alternative is you could use ply wood and paint or varnish it. 2. Drill a single 1 1/4" hole in center on each strip. Drill very carefully. 2. Attach both 12M and 17M wire ring terminals to the main feedpoint. 4. Temporarily secure the other end of each wire with a plastic tie or folding the wire over it's top most spreader. 5. Check the VSWR and trim to resonance for 12M and 17M. Secure wires to spreaders with plastic ties. AD5TH 5-BTV 10M and 20M needed a retune. 15M 40M and 80M VSWR was unchanged after the modification. 7. These photos are from AD5TH. I will add mine shortly. 1. I keep meaning to purchase/make a tilt over mount for my 6-BTV, AD5TH said this would have really helped throughout the procedure. It is more cumbersome to complete this modification without the aid of a tilt over mount. An alternative is to enlist the assistance of a helper and a ladder. 2. The wire lengths cited in the instructions are longer than needed by design so simply prudent trimming and testing will achieve resonance. It took AD5TH only 3 trim and test cycles to get both 12M and 17M flat. 3. 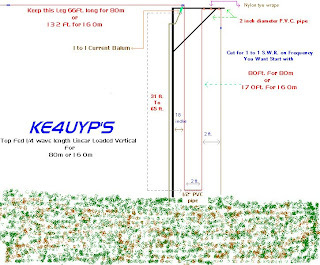 If your Hustler is ground mounted without any buried radials it is highly recommended that you add at least 25 or 30 ground radials at least 15 ft in length each. Radials in soil need not be "tuned" as "in-the-air" radials must be. At M1KTA QTH I have a lot of random lengths burried around the base of the vertical along with a couple of 4 foot ground rods, the water table is also very high. 4. AD5TH suggested with the 5BTV 20M can be stubborn and needed to be shortened but was already shortened to the max. So with the 6BTV I might have to add a capacitive hat to 20m (I have made one before for use with a buddipole on 160m! which is 3 18" lengths of coat hanger wire at 120 degrees separation perpendicualr to the mast which will raise the resonant frequency). AD5TH was then able to adjust 20m. As I am doing an antenna 'shoot off' especially as I bought a centre for the HEx beam/cobweb at GQRP rally this will be my 'reference antenna'. Drill a single 1&1/4 inch hole in center on each strip. Use 1 1/4 inch hole saw. Drill very carefully. 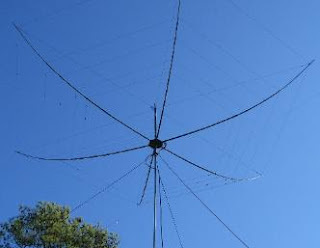 Disassemble your Hustler antenna and place a plexiglass spreader over the main tube at the very bottom right above the base and then place a spreader on top of the 10M trap and another on top of the 15M trap. The fourth and final spreader is installed at the bottom of the 20M trap supported by a plastic tie around the antenna tube directly beneath the spreader. Reassemble the antenna and test for proper operation on original 10/15/20/40/80M bands if 5-BTV. Likewise if 4-BTV or 6-BTV check on all original bands for proper operation after reassembly. Attach both 12M and 17M wire ring terminals to the main feedpoint. Temporarily secure the other end of each wire with a plastic tie or folding the wire over it's top most spreader. 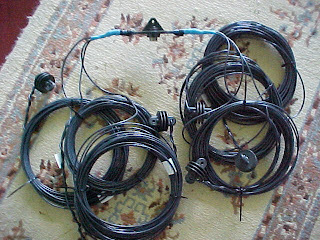 Check the VSWR and trim to resonance for 12M and 17M. Secure wires to spreaders with plastic ties. Typically after 12M and 17M are tuned you'll need to re-tune one or two of the other bands of the Hustler BTV. On my 5-BTV 10M and 20M needed a retune. 15M 40M and 80M VSWR was unchanged after the modification. I have a tilt-over mount on my 5-BTV so this really helped throughout the procedure. It is more cumbersome to complete this modification without the aid of a tilt over mount. An alternative is to enlist the assistance of a helper. The wire lengths cited in the instructions are longer than needed by design so simply prudent trimming and testing will achieve resonance. It took me only 3 trim and test cycles to get both 12M and 17M flat. If your Hustler is ground mounted without any buried radials it is highly recommended that you add at least 25 or 30 ground radials at least 15 ft in length each. Radials in soil need not be "tuned" as "in-the-air" radials must be. Today I completed retuning 20M and 10M. Now ALL 7 bands are under 1.3:1. 20M was stubborn and needed to be shortened but was already shortened to the max. I raised the 20M capacitive hat about 1 1/2 " which predictably raised the resonant frequency. I was then able to routinely lengthen the 20M adjustment and the match fell right in. On the way back from GQRP Mini convention we stopped off in a couple of service stations and to the probable puzzlement of the travelling companions Henning and Clive I collected a few items each time. Back in the shack I have started to look at different coil formers for use in homebrew so will add them to the ones I already have. From left to right they are straws from Burger King, Starbucks, Costa Coffee and wooden stirrers from Little Chef. The largest is the Starbucks clear straw. More info to be updated after testing. Just managed a qso with Roger. He has just 18mW!!!! I am one of those giving a talk this year. 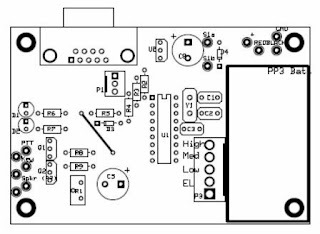 Alan M0PUB and Jan G0BBL will present recent developments from the popular Softrock kits to the new QRP2008 transceiver Project. They will also cover the trend towards "Direct to All Digital". 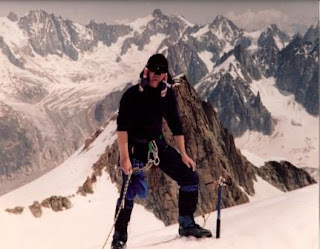 "Alpine Style" is a reference to mountaineering, back in early 20th Century the big mountains of the world were conquered by huge expeditions over many months with huge teams. Climbers now carry everything they needed"Alpine Style" and move self contained using whatever they had with them or found. Colin writes the popular SPRAT feature AAA (Antennas, Awards, and Anecdotes)and offers practical ideas for the operator who has to cope with limitedspace for antennas. 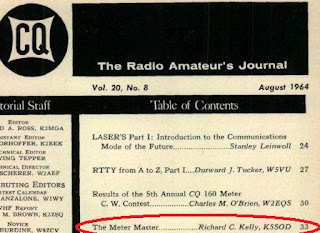 George Dobbs, G3RJVA little QRP philosophy and a few practical ideas. George is standing infor Rob Mannion of PW, who sadly cannot join us but sends everyone hisgreetings. A regular at the convention, David applies his flexible technical mind tosubjects suggested by your questions. You ask the questions and David provides his explanations. David enjoys active questioning from the audience, at all levels, so do not be afraid to ask him to pitch his explanations to your level. How many times have you bought a junk meter or salvaged a meter (like I did just before w/e) from some old bit of kit only to find there are no markings or worse the scale is bespoke, nothing to do with mA or V or worse apparently depended on some parts that are no longer connected. Going through a box of old magaznes found an article from 1964 about just this subject. Then I saw the circuit and thought there has to be something missing but there wasn't so I tried it and it works. The circuit as you see above is so simple. I will post images of the build and test steps, I used 4mm banana jack/binding posts from Maplin at AB, CD and EF. The article says you need two potentiometers, R1 (1K) and R2 (200k) the ones I used are 1K and 250K that happened to be in my junk box at the time. The article states that potentiometer with similar values can be substituted, and linear pots are best. I salvaged a couple of dual AA batery holders and used them and a couple of rechargable batteries. It takes longer to tell about how to use this than to actually perform measurements. 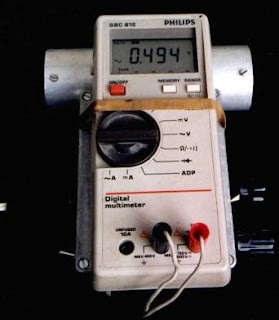 Once you have been through the process a couple of times, it only takes a couple of minutes to fully investigate a meters characteristics. What you do need is a meter with known characteristics and I used a good old elcheapo DVM from my collection (10 for £2) and it has some small amp meter ranges, to use with really small scale meters you might need something better. I suspect an analogue meter will work just as well. Let’s assume that you know absolutely nothing about your “unknown" meter which is usually a safe place to start. Place the unknown meter between C and D, The orientation needs to be so that positive voltage applied makes the meter move, most normal meters that means the positive lead connects to C. I have a couple of centre zero meters as well so the connection could be either way. With the battery connected select full scale on the switch position. Rotate R1 for maximum resistance. Many pots have maximum resistance (which will be minimum current) when the control is fully CCW, but the direction of travel is arbitrary and unimportant. The important thing is to be sure it is set for minimum current to start the test. If you have it set your DVM to read 200 mA, or more, then insert it into the circuit with positive lead to B and negative lead to A. Always start with a high current setting on your DVM and work down. You may see absolutely nothing on the meter, adjust R1 (reducing it) to obtain a full scale reading on the unknown meter by reducing the resistance. If a full-scale reading cannot be obtained with R1 set for minimum resistance, the unknown meter is beyond the current supply capabilities of the batteries. In such an event, disconnect the DVM quickly to prevent draining your batteries. This condition is probably due to an internal shunt in the unknown meter. This can be overcome as will be explained, later. If you have a full-scale deflection on the unknown meter, but there is little or no reading on your DVM, set the DVM switch to read less and less current until you obtain a reading for the full-scale current on the meter under test. If you cannot get a low enough scale you need to find another known meter. Remember you could get there using another 'unknown/now known meter' with a small enough scale! Anyway when the unknown meter is a FSD after adjusting R1 the THE CURRENT READING YOU SEE ON YOUR DVM IS THE FULL SCALE CURRENT OF YOUR (formerly) UNKNOWN METER. Easy isn't it? As I was wanting to use mine as an audio level S meter for the Norcal-20 O built (maybe a good idea?) I wanted a meter with FSD of between 100uA and 500uA. The first meter I tested has a full deflection current of 200 uA. Now before you do anything else adjust R1 for approximately 1/2 full scale, then disconnect the DVM. Replace the DMM with a jumper between A and B. If like me you use banana plugs this is made easier with a short 4mm to 4mm lead. Now re-adjust R1 for a full scale reading. Change the S1 to Half Scale and adjust R2 for a half scale reading. Set S1 back to Full Scale, and measure the internal resistance between E and F with your DVM. YOU NOW KNOW THE INTERNAL RESISTANCE OF YOUR (formerly) UNKNOWN METER. Your "unknown" meter is now very much known. Makes sure the DVM battery is not low otherwise your measurements may be out. I'll update the complications for meters where there is a very high internal resistance for a meter. If a full-scale reading cannot be obtained with R1 set for minimum resistance, the unknown meter is beyond the current supplying capabilities of the batteries. That this condition was probably caused by a shunt being built into the meter. For example, a meter that has a scale indicating it measures up to 10 Amps, it may have an internal shunt already simply because most meters are built to measure 1 mA, or less if no shunt resistor is used. Given that you are salvaging a meter, the next stage should not be a problem, surgery is required. That is, you must open the meter and remove the built-in shunt, then proceed as you would with a "normal" meter. The internal components are mechanically very delicate, similar to the insides of a mechanical watch. So, if you have the patience and dedication required to disassemble the meter, remove the shunt, re-assemble the meter and perform the Meter Master investigation as described above, you can salvage most any meter. Some are very easy to get into some seem to be sealed within plastic, your milage may vary and may not always be successful, but it will be a satisfying end if you are so inclined. If not, its best to simply toss the meter into the nearest trash can and forget about it. Finally made it into Cambridge this morning so visted the Royal Mail collection depot as I have had an item that came through customs to pay for and collect what on earth is it? Ah the Norcal 2030 partial kit ordered a while ago. So as I am sure everyone knows this rig is 20m or 30m and mostly surface mount components with a few through hole. The board is going to be pretty full. So time to print off the parts list and see what I have missing still. Think a 30m rig might be needed. Would you mind letting me know what you ordered?Also, what are you planning on doing to finish the case on the radio? 2. SPST minature toggle and 3. minature push buttons. There are two of each. 2 First is just one off so anything that can handle the current, or don't bother and jumper it and use the dc connector? The other is front panel (first image one labelled SPOT) S1 for RIT/XIT control so could be almost anything. Connections just to left of "N7SE" silk screen bottom left of board top. Page 2 of the schematic top left. 3 are for keyer command (S3) top right and AFA (S2) (just right of centre of board left of IC1) you cannot see the connection on the board photos. 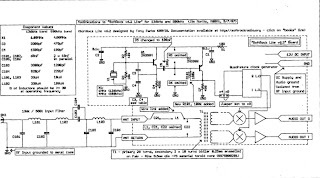 Manual Page 46 fig 44. Page 4 of the schematic. Again clearly on front panel, look at manual images.They are push to make, monentary. Following on from a post on QRP-L I recieved this kit 24th June and proceeded to build it within days day following the 1C version of the instructions, especially watching the polarity of D3 and D4 and D1 and D2 but the meter exhibits some very wierd behaviour. 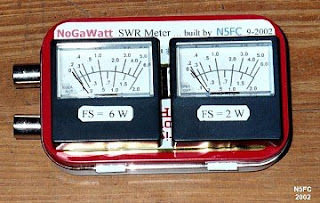 On power on the meter, with no RF connections states F:1.4W R:1.4W SWR:9.9 and the analogue meter reads hard over FSD. Or the R (reverse) jumps about and so does the SWR and the meter bounces to FSD (see the video clip). I first thought it might have been the battery so I changed that but no change in behaviour. I put it down to making a basic error somewhere and thought nothing more of it and thought would return to look at this later when another on the QRP-L list posted a similar problem. So thought perhaps wasn't just me. As I built it, you can see there isn't much to it, but see if you can spot the problem before you look at the solution lower down the post? The problem was D3 and D4. I should have read the schematic and used the brain cells! I removed the IN5711 provided and used a matched pair of 1N5711 (red and black not blue and black diodes in above pictures), and the circuit now works exactly as it should. As Bruce N1RX said in an email... "You put the diodes in opposite from the pictures in the manual. By that, I mean you put the end closest to the board in the opposite hole, but you had the -polarity- of the diode reversed from what it should be. The revised instructions are correct IF you bend the leads so that the band is facing UP as in the pictures. You have the bands 'facing down'. Use your schematic. The cathode (banded end) of D3 should be connected to pin 6 of U3. The cathode (banded end of D4 should be connected to pin 2 of> U3." After asking for some help finding the 6th Edition of the Radio Communication Handbook on GQRP list I also exchanged a few emails with a few others others and Mike G3TSO the designer of one of the has sent me a lot of information. So will look at building a variation on this design. 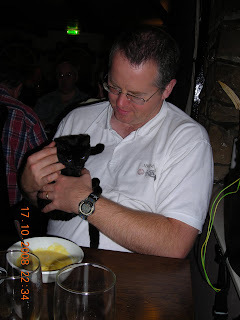 In addition I have started to look at the older Kitten II that was covered in SPRAT (from G3ROO) as well. I also have the board layouts and many of the components for the Multipig+ rig as well. The modular nature of all these constructions are of interest. As about to have a go at 137Khz qrp going to build a QRSS beacon controller. The Freakin' Beacon is of interest and as I have the 16F628 and all the components going to put one together. I like to homebrew things and have a nice tin with slightly different dimensions to the original so have crafted a PCB mask using Express PCB and will etch a little later. Note the TO92 components are not necessarily the correct way around but then I don't use the silk screen anyway! Please buy the kit from them, I will not share the Express PCB layouts without permission. I need some of these old style RF chokes in range 1mH to 10mH. I subscribe to the RSGB -LF group emails as one day I might get a NoV for 500kHz. Part of the new antenna builds will be aimed at improving my antennas for this band. Last xmas during the GQRP xmas contest I operated cross band (3.5MHz/500kHz) manual CW with several that do hold NoV on 500kHz. 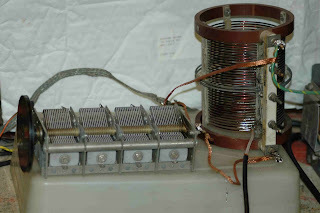 Operation on 500kHz is a very narrow band and I found my FT817 could be used without any modification what so ever to RX the signals so I connected it to my 6BTV vertical adding a base loading coil 'bucket load' (Literally a bucket and c200m of multistranded wire wrapped around the bucket). Adding the base coil made the signals jump maybe 1-2 S points. I parked the RX on 502kHz and listened a lot.... after a time I heard some of those I saw post on the reflector so I thought here goes nothing... and emailed one or two and asked if interested in x band operating. Operation this way the first time you do it is odd as you RX on 500kHz but tx on 80m frequencies. Still once you get the hang of it, it is pretty easy. Having a rig that operates split helps a lot but you can do it manually with two rigs. Anyway suffice to say I manged a dozen or so contacts even with my completely awful cw and even posted on GQRP list after working Ian G3ROO this way. The LF activity seems to have increased of late as the nights draw in again. Note that the humble softrock RX can be employed on 500kHz and I have a dedicated RX built just this way. I also built a clone of M0MBU TX starting from the design in RSGB LF Today using MOSFETS, This is a picture of the final board, so don't get into problems I have not added the MOSFETS to it so cannot be used for TX. You can see the holes for the TO220 heat sink screws in the middle of the board. The whole board will be bolted to a heatsink. I modified the design to use a DDS based VFO not a 4MHz resonator (didn't have one at the time) and a divider network. The VFO feed comes in to the two holes on the bottom right, with the 4427 IC (8 pin DIL) just above. The DDS VFO uses a free AD9851 but with DIL dip switches not a PIC and rotary controller (originally an idea from Hans Summers http://www.hanssummers.com/radio/dds/index.htm). There are many different designs out there for LF capable DDS. I created the TX PCB layout with Express PCB and blue press n peel film and then etched it. The track side shows the wide spacing of the different parts. More as an exercise if could it be done that should it be done I took this and a few other project boards to FDIM show and tell. Most of the components were salvaged from an old APC UPS which was a wonderful source for the high value capacitors needed. I even include an LPF on the board (left hand side the paired up capacitors) as I wanted to use this /P from a beach with a kite antenna.... maybe one day. For the shack a PCB box containing a 7 pole LPF for 500kHz was also constructed complete with SO239 connectors the design came from http://www.g0mrf.freeserve.co.uk/lpf.htm I think, not checked log, that G0MRF was one of those xband QSO. http://www.wireless.org.uk/pa0se.htm using a cheap digital meter. I bought a box of 10 of them for £2 and I have employed a few about the shack, one as an RF probe another pair monitor the V and I of a HB power supply. I have a wide band FSM using an AD8307 as well so might see if I can add a band pass at the front as well. Lastly you have to demonstrate that you can measure frequency and I have a PIC based frequency meter that I know will work down to 100kHz ready for use. I calibrated it against a 1Mhz crystal oscillator but I probably have to do better than this. I might even add a small PA to c5W as I note I have some IRF630 salvaged from that same APCUPS mentioned above. For a 137kHz antenna a fishing pole supported wire and base load will be employed. or I might try Finbar GI4DPE (another x band qso) design for a spiral (1/4 wave?) at 8m AGL. And as I have an almost identical setup I used for a tuner initially I will be using this for my 160m 1/4 wave antenna. The coil on mine is wound over a paxolin(?) former with added tap points, the capacitor on mine is almost identical with 4 x 250pF sections. When in place will add details of my 500kHz station. Been agonising over this for ages (2 years+). Do I need or want a better antenna at the home QTH? Every time seem to operate from home for contest etc it involves putting up a dipole as the vertical (Hustler 6BTV) works FB but just doesn't seem as useful for inter G working on 80m and seems limited to working EU stations only. As soon as a dipole or G5RV goes up the US opens up and there is more DX heard. The recent windy WX in UK had seen a tree limb came down at the bottom of the garden and it bent literally the vertical over at 60 degrees about 5ft AGL and also took out the dipole support. A new length of Ali tube was obtained and antenna is back up again but thought time to consider the options. Nice small footprint and will fit on gable end of garage or side of house easily! Will fit on side of house but not easily! Downside is also long feeder. Simple Dipole for 80m or a fan dipole. 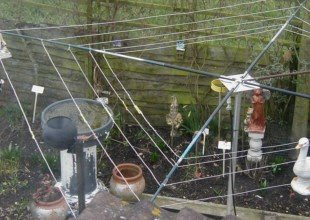 However run into the "wires down the garden XYL and neighbour problems". Copper Pipe, got some 22mm pipe and 90 degree couplers and end stops or 1/2" heliax (LDF-450) Mag loop. Maybe could build this and put in attic? The ground system could/would need to be be improved as well so I picked up a few extra ground spikes that were on sale at B&Q. So bought a couple dozen 5m telescoping fishing poles and will start a 'shoot off' as I will construct the cobweb and hexbeams for all bands 10m through 20m. And a mag loop for 40m and 80m. For 160m I will look at the sloper and any other antenna designs I have seen. I might end up having to stick with the vertical and a dipole but this might be fun. As I progress will post the results and which tuners worked best if needed. My rear garden is larger than most at > 50m long but narrow 15m, It runs N-S with shack at South, house at North. I have 2 large 60ft+ poplar trees next door to the East. No cannot use them I asked but it is tempting to fire a line over them but when windy the tops whip about a lot so any antenna would be shredded or drag the shack with it! All activity will be QRP only. Back in May 2008 I spent a week with Ken Evans and Ted Bruce (and a few other amateurs) at FDIM/Dayton 2008 and they mentioned the NoGaWatt meter so I thought I'd have to try it. At the 2007 GQRP rally Henning Mikklesen OZ4XF gave me a pair of dual meters which are high quality dual channel VU meters surplus from some B&O project that never happened. The scale is 250uA FSD and a little more that the NoGaWatt project so I will adjust things a little. I used a couple of Ge diodes bought from Harrisons (Local repeater group rally at Bottisham, wx was cold and wet that day and did the round trip 20+ miles by bicycle with xyl!) and two 47 ohm (matched from a big batch) 10W resistors that measured 49.2(ish) ohms. I also have a load of 51 ohm resistors and I have another version using a load in series/parallel combinations to obtain 50 ohm. I switched the trim pots for minature rotary pots after proving the construction worked as I wanted to be able to adjust the scales. 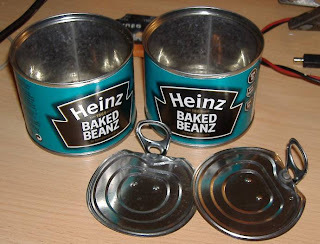 In HB style I have used Double sided PCB to fabricate a sloping front box, I was going to try and use the humble backed bean tin (http://www.hanssummers.com/electronics/equipment/bcdfreq/beans.jpg) but didn't have enough as the green bins were just collected and xyl threw out my stash of tins. The meter being almost 4 1/2" across meant this was never going to be an Altoid project. I initially wound the FT50-43 with 24SWG wire but will replace the single turn with a length of RG174. I have a load of 50 ohm 100W chip resistors so adding on as a dummy load. Put 4 out just to see if would fit as also available in smaller 10W variety also TO220 so would put them on back with a switch of the VSWR meter and have a dummy load too. I am also playing (right word?) with PIC variations and I have some 2x40 (yes 40) character displays from Diz W8DIZ and I have an initial PIC VSWR working that shows the fwd/rev and VSWR as figures on the left and moving bar graphs. When complete and stable I'll add the details. I am using a 16F874A (same as 16F877A but 1/2 memory).